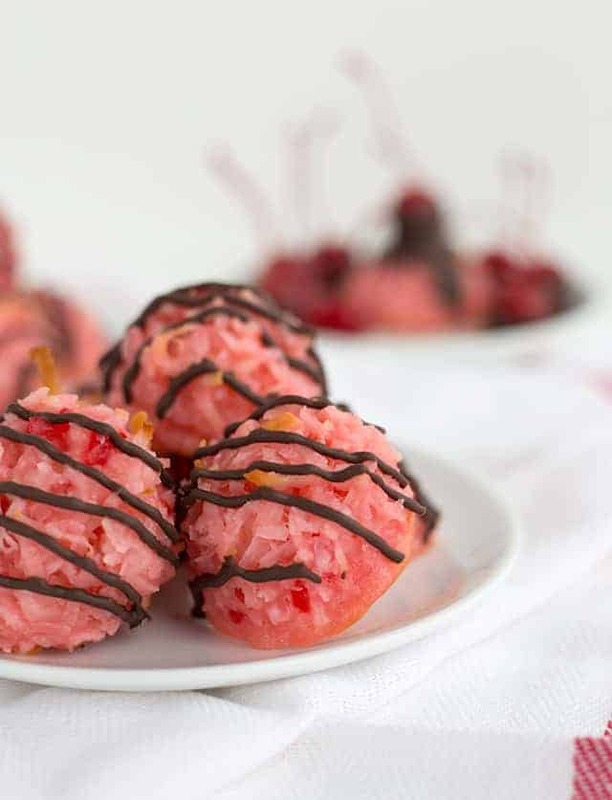 These cherry coconut macaroons with a drizzle of chocolate remind me of a chocolate covered cherry. They are loaded with maraschino cherry juice and bits of maraschino cherries. These cookies will make any coconut lover happy! 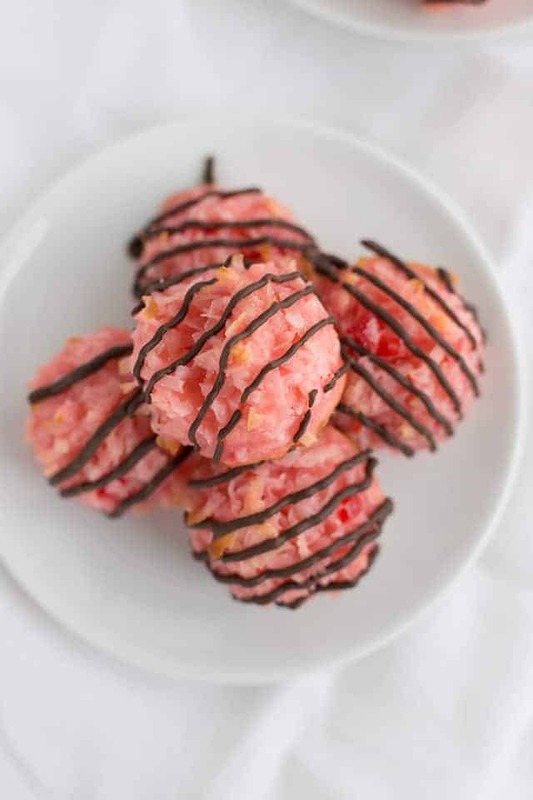 Side note, I also have an almond joy macaroons recipe! Valentine’s Day is right around the corner and I love making pretty red and pink desserts just for the occasion. For example, the pretty pink and white strawberries and cream cheesecake recipe I just posted yesterday. Today are my cherry coconut macaroons. I cannot get over the color. It’s just so pretty. I’ve come to the realization that I need more macaroons on my blog. I really have no interest in coconut myself, but my son loves it as well as my bestie down the road. They were my taste testers for these guys. These macaroons are so simple to make and take no time at all to whip up! Plus, it only takes a handful of ingredients to put together. Crazy, right? I wish my husband and I liked coconut. These would be our second go-to cookie recipe. The first will always be my dark chocolate no-bake cookies. This post wasn’t just for Valentine’s day though. It’s also for the annual Cookies for Kids’ Cancer fundraiser. Food bloggers come together to donate to the charity and also create a recipe post to bring awareness to the fundraiser. We also have some awesome brands matching dollar for dollar which is amazing! Do you want to donate to the cause? I’ll leave a link here for you. It looks like we’ve hit the initial goal with just food blogger donations! Woohoo!! This cookie originally started out as a cherry chocolate chip macaroons with mini chocolate chips in it, but the chocolate just overpowered any flavor the cherry had. I eventually (obviously) just cut the chocolate chips out completely and drizzled some almond bark chocolate on top. 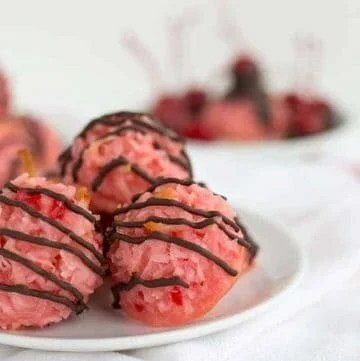 These cherry coconut macaroons are loaded with maraschino cherry flavor, from the juice to bits of cherries. A drizzle of chocolate to the tops makes a nice addition too! In a large mixing bowl, whisk the egg whites, sugar, sweetened condensed milk, maraschino cherry juice, and salt until frothy. It may take about 2 minutes to do it. Add the coconut and chopped maraschino cherries. Stir until all coconut is covered with mixture. Add in the flour and stir until completely incorporated. Using a 1 1/2 T. medium cookie scoop, scoop out the cookie. Place on the prepared baking sheet. They won't spread. Bake for 17-19 minutes until the coconut bits get golden brown. In a microwave-safe bowl, add the chocolate almond bark in. Microwave for 30 seconds and stir. Repeat until the chocolate is smooth. Place the chocolate in a sandwich bag. Cut a very small hole in one of the corners of the bag. This will help to drizzle over the top of the macaroons. Place the cookies on a piece of wax paper or parchment paper. Drizzle the chocolate on the top of each macaroon moving back and forth over the top of each cookie. Let dry. Be sure to drain the maraschino cherries and dab them dry with a paper towel before finely chopping them. These look delicious! Happy to be part of this blogger fundraiser with you! 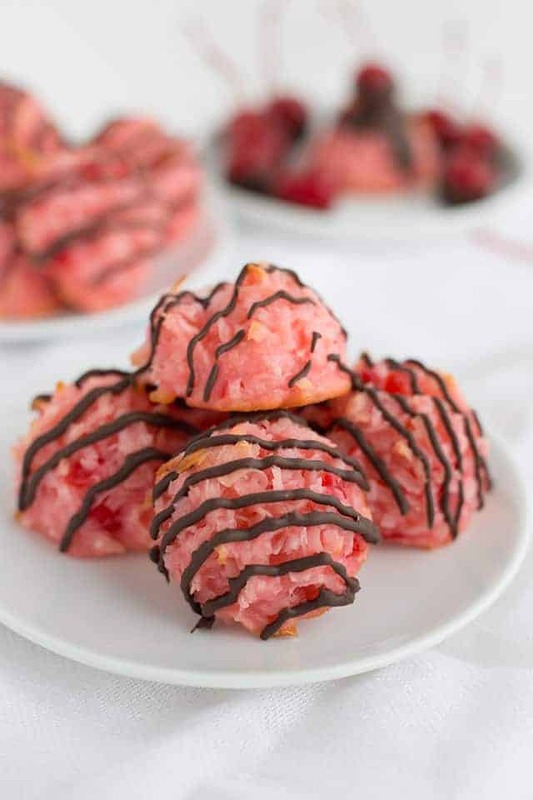 Loving this cherry coconut macaroons. Brilliant idea of adding the cherry juice, love the color! Thanks for being a part of this amazing cause. Love Cookies for Kid’s Cancer. Yay I have all the ingredients, I’ll have to make this tonight! Looks amazing, thanks for sharing! I will try using real cherries in the recipe instead of maricino cherries which contain high fructose corn syrup.. Sounds like a plan! Let me know how it turns out. These look delicious, I am going to make them on Friday night!